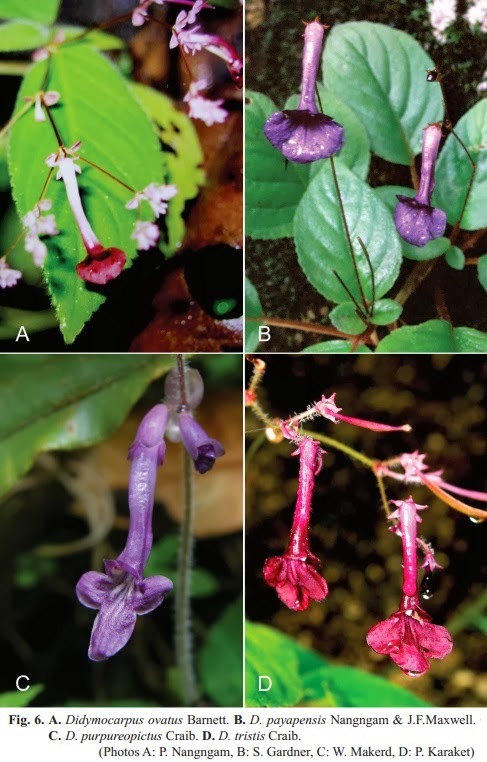 A taxonomic revision of Didymocarpus (Gesneriaceae) in Thailand has resulted in eighteen species. 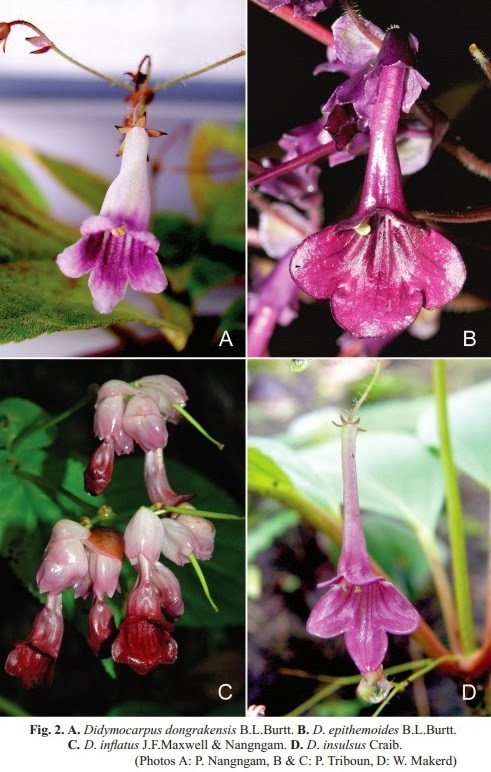 Three new species are described: Didymocarpus inflatus J.F.Maxwell & Nangngam, D. jaesonensis Nangngam & J.F.Maxwell, and D. payapensis Nangngam & J.F.Maxwell. 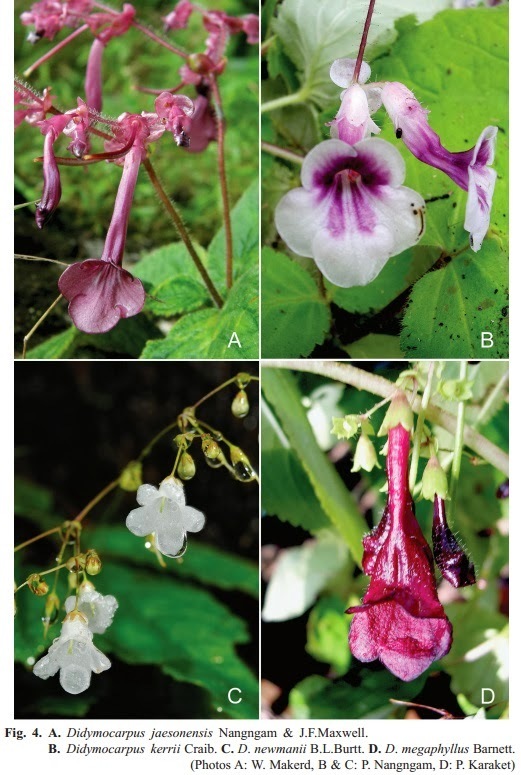 A key to the Thai species, detailed descriptions, and notes on distribution, ecology, phenology, salient morphological traits, and illustrations are presented. Pranee Nangngam and J.F. Maxwell. 2013. Didymocarpus (Gesneriaceae) in Thailand. Gardens’ Bulletin Singapore. 65(2): 185–225. Somrania flavida D.J.Middleton & Triboun, sp. nov. 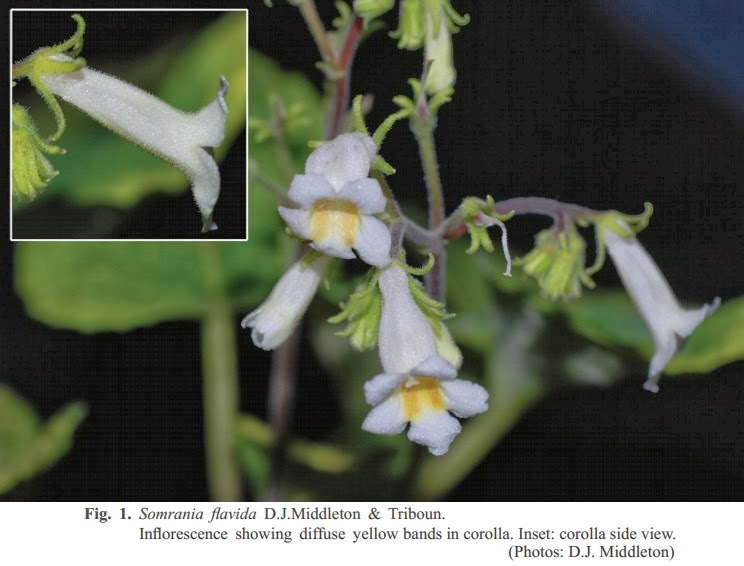 The new species Somrania flavida D.J.Middleton & Triboun, from Khao Sok National Park in Surat Thani Province, Thailand, is described. It is the third species in this genus which is restricted to karst limestone habitats in Thailand. A key to the species of Somrania is provided. David J. Middleton and Pramote Triboun. 2013. 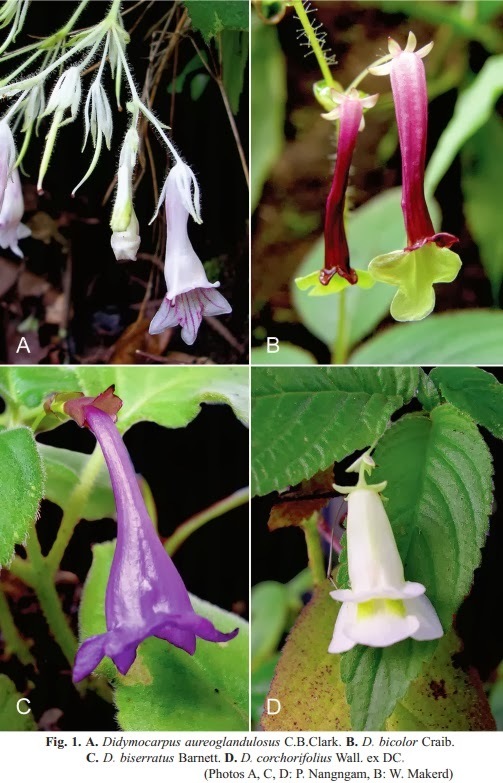 A New Species of Somrania (Gesneriaceae) from Thailand. Gardens’ Bulletin Singapore. 65(2): 181–184. Coelogyne phuhinrongklaensis Ngerns. 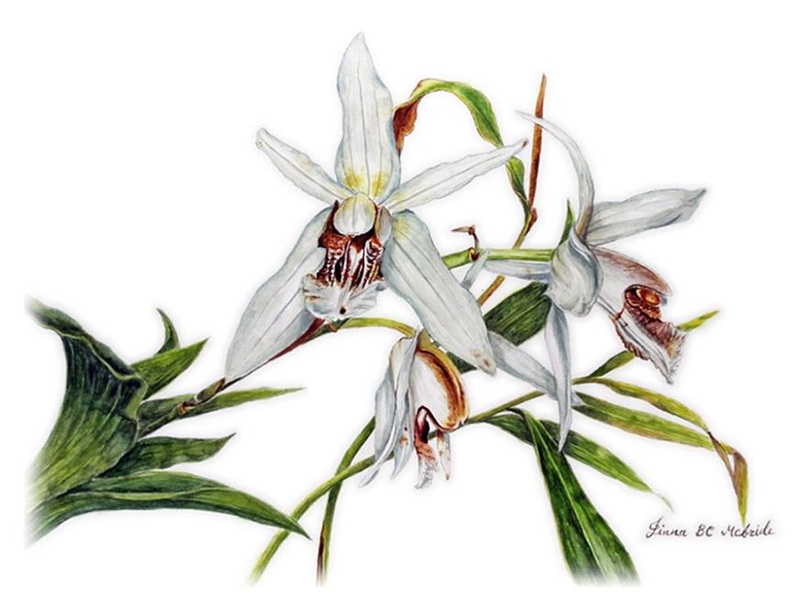 & P. Tippayasri (Orchidaceae), a new species from northern Thailand is described, illustrated and presented. It is an epiphyte or lithophyte in montane forest at 1100–2100 m altitude. 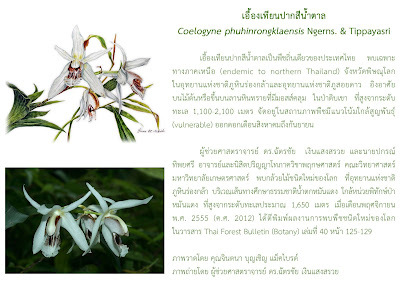 KEY WORDS: Coelogyne phuhinrongklaensis, Orchidaceae, new species, Thailand. Vernacular.— Ueang thian pak si nam tan (เอื้องเทียนปากสีน้ำตาล). Etymology.— The generic name, Coelogyne from the Greek koilos, hollow, cavity, and gyne, female, which refers to the concave stigma (Pridgeon et al., 2005). The speciﬁc epithet is named after Phu Hin Rong Kla National Park where the authors found and collected the type specimens. P. TIPPAYASRI & C. NGERNSAENGSARUAY. 2012. 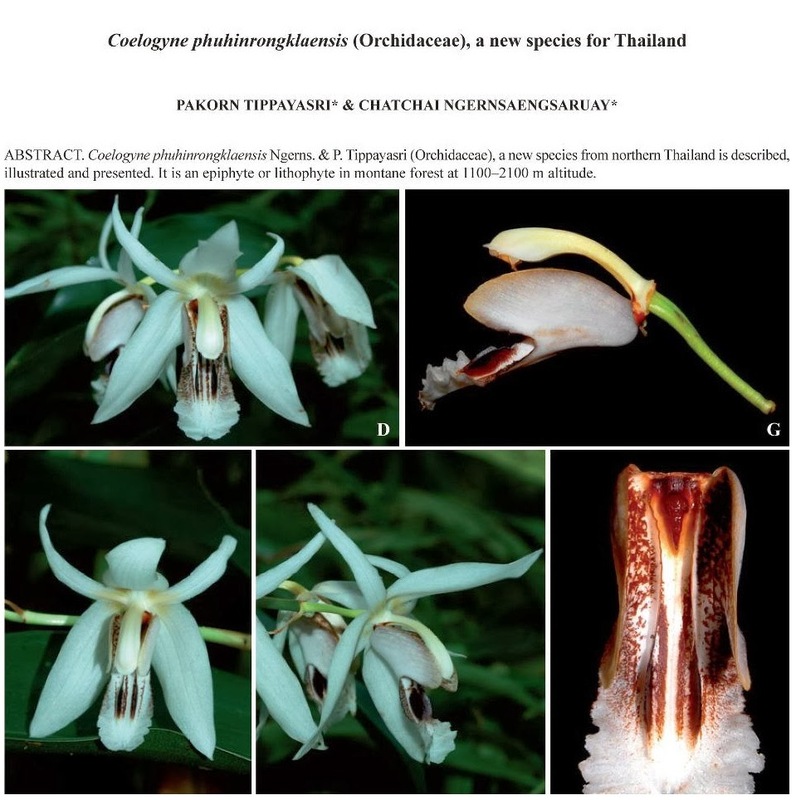 Coelogyne phuhinrongklaensis (Orchidaceae), a new species for Thailand. THAI FOR. BULL. (BOT.) 40: 125–129. 2012. (upper:- male holotype) from Gua Pari-pari with original tail. (lower:- female) from Gua Angin with regenerated tail. A new species of karst dwelling Cnemaspis is described from western Sarawak, Malaysia on the island of Borneo. Cnemaspis paripari sp. nov. is presumably endemic to the karst outcroppings which extend approximately 4.2 km between Gua Angin and Gua Pari-pari in the district of Bau. It is the only species of Southeast Asian Cnemaspis with a median, subcaudal row of bead-like scales and whose adult males have a bright yellow head and a bright yellow regenerated tail. Cnemaspis paripari sp. nov. differs markedly from the other three species of Bornean Cnemaspis in aspects of size, squamation, and coloration and its presence underscores the potential unrealized diversity of this genus in Borneo as compared to Peninsular Malaysia. FIGURE 5. Cyanaeorchis praetermissa. A. Habitat: permanently wet grassland (campo limpo úmido) at the margin of gallery forest in Presidente Kubitschek, Minas Gerais, at the beginning of the rainy season. B. Uprooted plant, showing roots and stem base; remnants of the withered stem from the previous growth season are indicated by an arrow (Batista & Bianchetti 3175, BHCB). C. Inflorescence (Batista et al. 3041, BHCB). D. Flower, partial lateral view (Batista et al. 2218, BHCB). Cyanaeorchis arundinae. E. Flower, partial lateral view (Batista 312, CEN). Cyanaeorchis minor. F. Flower, partial lateral view (Klein 124, BHCB). Scale bars = 5 mm. We investigated the phylogenetic placement of Cyanaeorchis and selected representatives of the tribe Cymbidieae based on nuclear (ITS) and plastid (matK–trnK and rbcL) DNA sequences. Bayesian and parsimony analyses of separate and combined datasets were largely congruent with each other and showed that the Neotropical Cyanaeorchis does not belongs in the predominantly Old World subtribe Eulophiinae, where it has previously been placed. Instead, it is strongly supported as a sister to Grobya in Catasetinae. 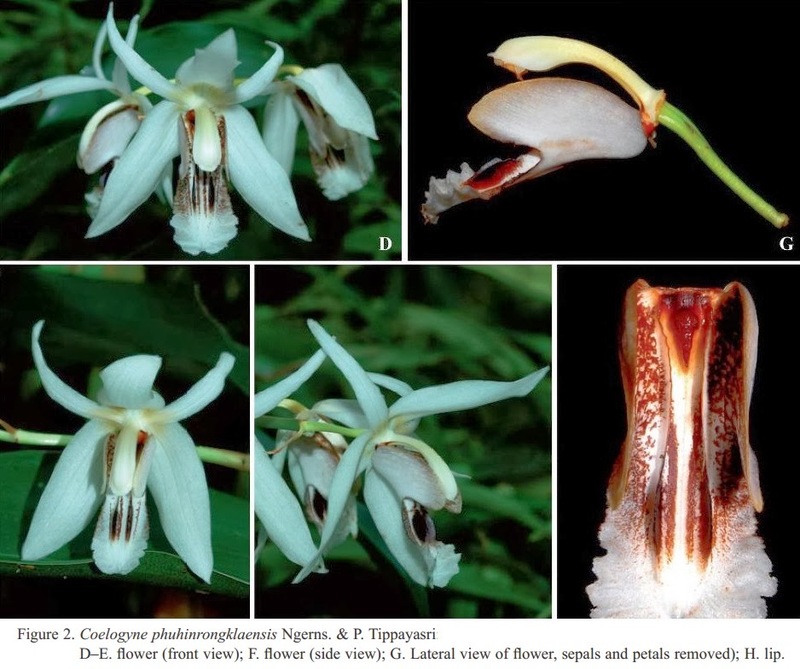 Because Catasetinae are Neotropical and there are no unequivocal morphological similarities between Cyanaeorchis and other genera in the subtribe, this relationship reflects a geographical rather than morphological similarity and suggest habitat-driven local diversification. Specimens from central Brazil formerly identified as Cyanaeorchis minor are shown to be a distinct species, described here as C. praetermissa. Niche modeling indicates that C. praetermissa and C. minor have different distributions and ecological niches, whereas a third species, C. arundinae has broader climatic tolerances and a distribution that encompasses those of the other two species. The distribution of the genus is also predicted to include Bolivia, the states of Rio de Janeiro, Espirito Santo and several areas in northeastern Brazil, from where no collections are currently known. Cyanaeorchis arundinae. E. Flower. Cyanaeorchis minor. F. Flower. Scale bars = 5 mm. Cyanaeorchis praetermissa J.A.N.Bat. & Bianch., sp. nov.
Distribution and Conservation Status:— Restricted to the cerrado biome in central and southeastern Brazil in the states of Goiás and Minas Gerais and the Federal District (Fig. 4A). The species is known from 13 collections at seven localities. 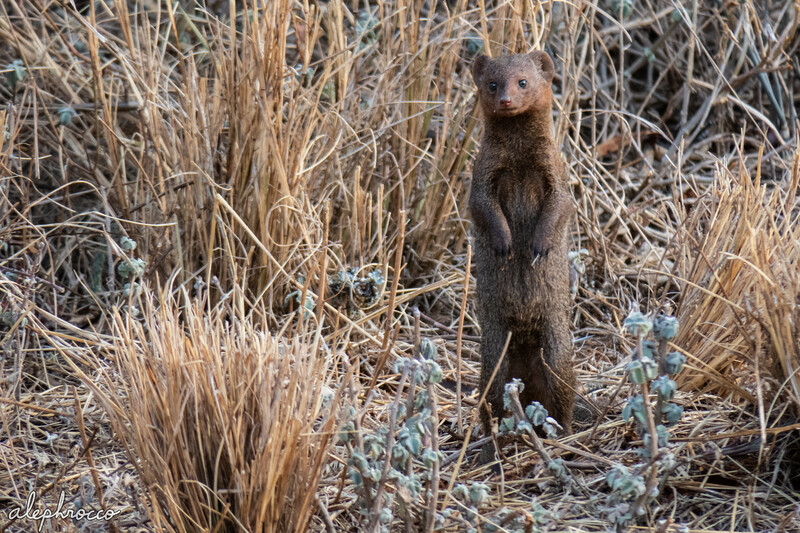 Most collections and some of the larger known populations of the species are from the Federal District, where the species seem to be most threatened. The population at Setor Mansões Park Way has been destroyed, whereas large populations at Santuário Ecologico do Riacho Fundo and Reserva Ecológica do Guará have been severely depleted in the last 20 years due to alterations in habitat quality. Based on the World Conservation Union Red List Categories and Criteria (IUCN 2001), C. praetermissa can be tentatively classified as Vulnerable (VU) (criteria A2ac; B2ab (ii, iii, iv); C2a(i)). 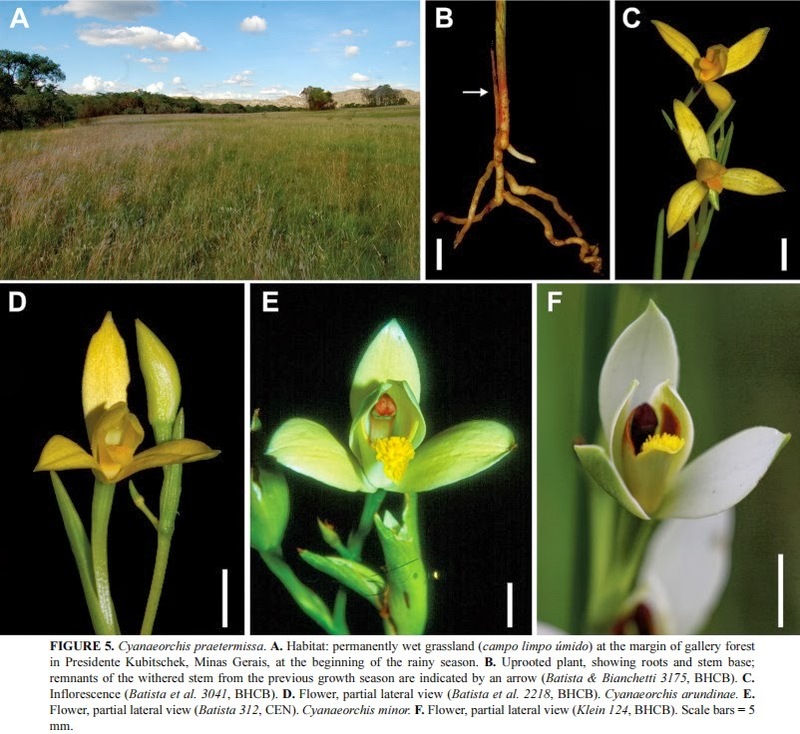 Habitat and Ecology:— Cyanaeorchis praetermissa grows in permanently wet grassland, campo limpo úmido, according to the classification of Ribeiro & Walter (2008), over dark, water-saturated, hydromorphic soil, usually near the border of flooded gallery forests (Fig. 5A) or in veredas (grasslands with buriti palms), 1000–1400 meters above sea level. Vegetative and reproductive growth are associated with rainfall, and blooming occurs at the beginning of the rainy season, from October to early December. Blooming appears to be strictly related to brushfires that occur during the dry season. All collections of the species made by the authors (12 of the 13 known collections) were made in recently burned areas. The species is sympatric with, and flowers at about the same time as, other orchid species, such as Veyretia simplex (Grisebach 1864: 641) Szlachetko (1995: 116), Habenaria edwallii Cogniaux (1906 publ. 1907: 275), H. balansae Cogniaux (1906 publ. 1907: 271), Gomesa hydrophila (Barbosa Rodrigues 1877: 92) Chase & Williams (2009: 397), G. barbaceniae (Lindley 1855: 32) Chase & Williams (2009: 395), Epidendrum dendrobioides Thunberg (1818: 17), Cleistes castaneoides Hoehne (1939: 42) and Cyrtopodium fowliei Menezes (1995: 17), all also typically found in habitats with water-saturated soil. Populations of Cyanaeorchis praetermissa usually form compact groups with large number of specimens, whereas C. arundinae and C. minor are usually found as scattered individuals or a few plants. Etymology:— From Latin, meaning overlooked or neglected, in reference to the new species having been overlooked by previous taxonomists. 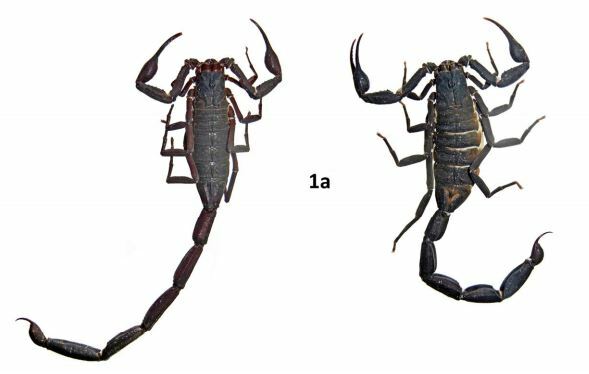 We describe a new species of Leptolalax from northern Vietnam. Leptolalax botsfordi sp. nov. is distinguished from its congeners by a combination of (1) supra-axillary and ventrolateral glands present; (2) dark brownish red ventral surface with white speckling; (3) medium body size for the genus (29.1–32.6 mm in 7 adult males, 30.0–31.8 mm in 2 females); (4) black markings on the flanks absent; (5) toes with rudimentary webbing and weak lateral fringing; (6) large pectoral glands (1.1–1.9 mm; 4–6% SVL) and femoral glands (2.4–4.3 mm; 7–14% SVL); and (7) an advertisement call with a dominant frequency of 2.6–3.2 kHz (at 14.0º C). At present, the new species is known only from upper montane forest between 2,795–2,815 m elevation on Mount Fansipan, Hoang Lien National Park. To our knowledge, Leptolalax botsfordi sp. nov. occurs at higher elevations than any other species in the genus. If L. botsfordi sp. nov. is truly restricted to a narrow, high-elevation band, it is likely to be particularly vulnerable to the effects of climate change. The new species also faces the immediate threat of habitat degradation and pollution due to tourist activity. only from near the top of the highest mountain in Indochina. Rowley, Jodi J. L., Vinh Q. Dau & Tao T. Nguyen. 2013. 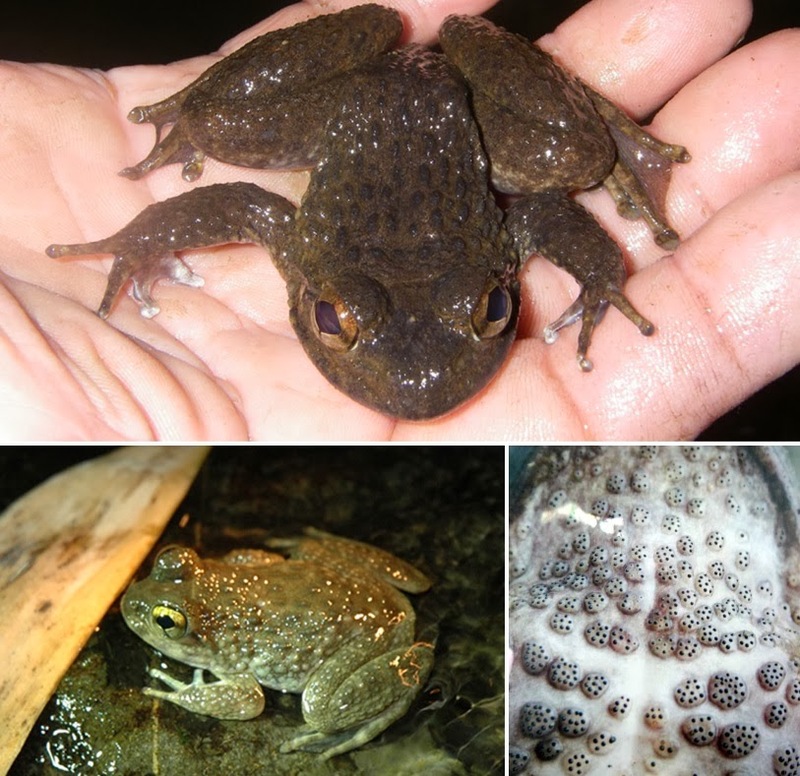 A New Species of Leptolalax (Anura: Megophryidae) from the Highest Mountain in Indochina. Zootaxa. 3737(4): 415-428. Figure 1. Life photographs of Quasipaa fasciculispina. Upper (Khlong Kreua Wai Wildlife Sanctuary, Chanthaburi Province); bottom left (Huay Khao Plu, Muang Trat District, Trat Province); and bottom right (cluster of spines on chest and breast of adult male in breeding season). 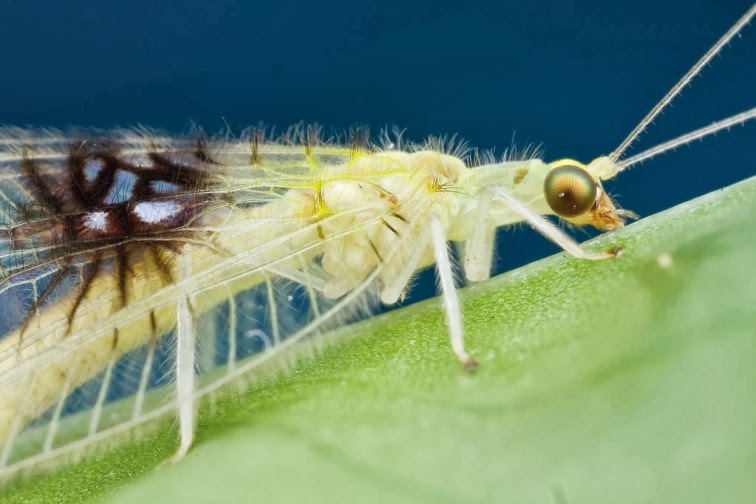 The current work presents a new locality for Quasipaa fasciculispina (Inger, 1970) documenting the first provincial record based on voucher specimens for Trat Province (eastern Thailand). Its geographical distribution is reviewed and a recent distribution map in Thailand is presented. Upper left (Khlong Kreua Wai Wildlife Sanctuary, Chanthaburi Province); bottom left (Huay Khao Plu, Muang Trat District, Trat Province); and right (cluster of spines on chest and breast of adult male in breeding season), with distribution map. 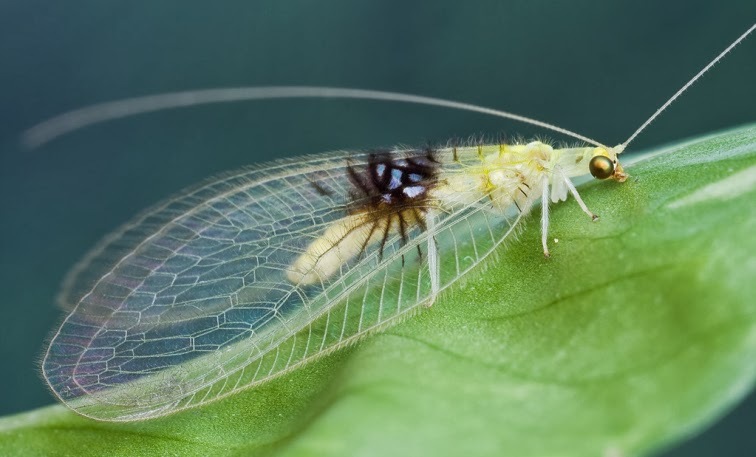 Prior to this study, the distribution of Quasipaa fasciculispina in Thailand was reported from the provinces of • Chanthaburi [Khao Chamao-Khao Wong National Park (Forest Biology Department unpublished data), Khao Kitchakut National Park (Noikotr and Lauhachinda 2002; Chan-ard 2003; Nabhitabhata et al. 2004; Inthara et al. 2005; Nabhitabhata and Chan-ard 2005), Khao Sip Ha Chan National Park (Danaisawat et al. 2010), Khao Soi Dao Wildlife Sanctuary (Inger 1970; Chan-ard 2003; Nabhitabhata et al. 2004; Nabhitabhata and Chan-ard 2005; Inthara et al. 2009), and Namtok Phliew Naitonal Park (Chan-ard 2003, as Khao Sra Baab )] and • Trat [Bo Rai District (Inthara et al. 2005)]. The locality lying southward from the type locality (Khao Soi Dao) is “Khao Sra Baab” according to Chan-ard (2003), but neither voucher specimens nor photographs are provided in this work. Although Chan-ard (2003) provides a live photo of this species, the photograph did not provide the locality of the frog. 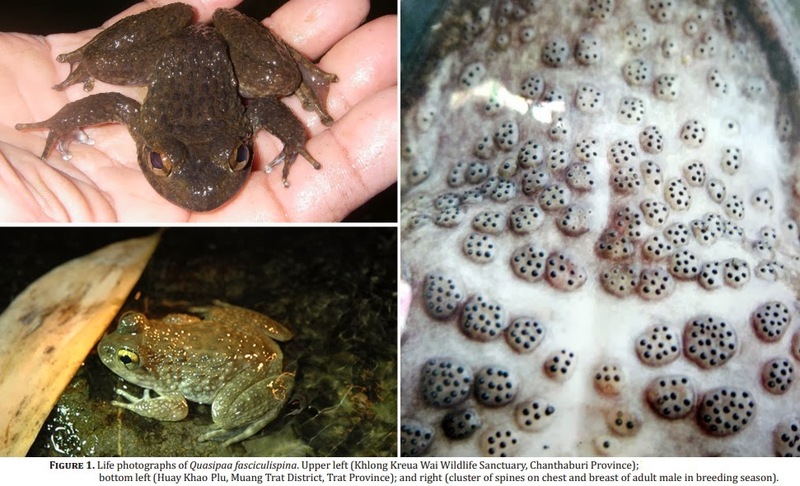 A herpetological study in Namtok Phliew National Park was recently conducted by Narongrit Sukprakarn, but the research failed to document Q. fasciculispina in the national park (see Sukprakarn and Nabhitabhata 2003). Moreover, the distribution in Thailand is usually claimed to range from eastern Thailand extending to the Cardamom Mountains in western Cambodia (see Chan-ard 2003). However, the record indicates that the occurrence of this species in Trat Province was in Inthara et al. (2005). Unfortunately, they did not refer to voucher specimens. Although several studies were conducted in Trat Province (e.g., Smith and Kloss 1915; Taylor and Elbel 1958; Taylor 1962; Ha-Ngam et al. 2006) unfortunately, they failed to document Q. fasciculispina. Therefore, the current work documents the first provincial record (based on voucher specimens) for the province, and its geographical distribution of the species in Thailand is now extended southward to Trat Province. The collected site is ca. 150 km southeastern from the type locality (Figure 2). The area is a secondary forest which was been previously logged. The global and local status of Quasipaa fasciculispina have the same VU evaluation according to two published works (Nabhitabhata and Chan-ard 2005; Stuart et al. 2008) and IUCN (2010). The species is protected under the WARPA law of Thailand. The species is found in protected areas (such as national parks and wildlife sanctuaries etc.) where there is strong enforcement to its conservation. However, illegal consumption still occurs and more intensive conservation strategies are needed. Further study is needed to explore the distribution range in neighboring areas. Probably additional undiscovered populations exist in the streams of a small range of mountains along the Thai-Cambodian border and also in the mountain on an island such as Koh Chang (southwestern of locality 5 in Figure 2). Other disciplines are recommended to further research: exploitation pressure, status evaluation, and frog propagation. Yodchaiy Chuaynkern, Prateep Duengkae, Pongpitak Sribandit, Komsan Bunchornratana, Chantip Chuaynkern, Nont Khewwan and Sawang Tipayanukul. 2011. Amphibia, Anura, Dicroglossidae, Quasipaa fasciculispina (Inger, 1970): Distribution extension. Check List. 7(2). 114-116. 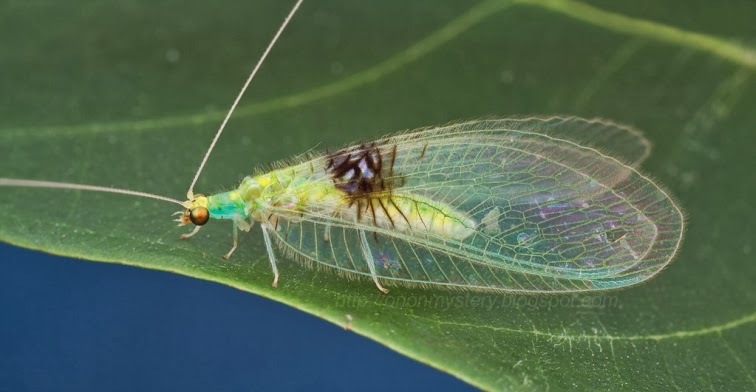 An unusual new species of green lacewing (Neuroptera: Chrysopidae: Semachrysa jade sp. n.) is described from Selangor (Malaysia) as a joint discovery by citizen scientist and professional taxonomists. The incidental nature of this discovery is underscored by the fact that the species was initially photographed and then released, with images subsequently posted to an online image database. It was not until the images in the database were randomly examined by the professional taxonomists that it was determined that the species was in fact new. A subsequent specimen was collected at the same locality and is described herein along with another specimen identified from nearby Sabah. Figure 2. Semachrysa jade sp. n. female habitus, specimen that was originally photographed and released (Morphbank: 791596). Forewing length: 15.0 mm. Figure 1. Semachrysa jade sp. n., female holotype habitus (Morphbank: 791595). Forewing length: 15.0 mm. 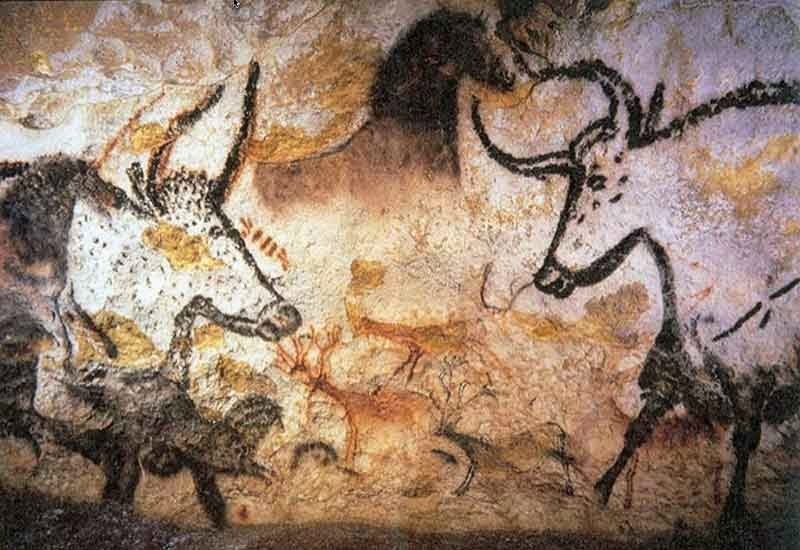 In the year 2001, some conspicuous black stains appeared on the walls of Lascaux Cave in France, which progressively disseminated throughout the cave. These black stains were so evident by 2007 that they have become one of the cave’s major problems. In a mycological study of the black stains, Ochroconis strains were abundant among the isolates and constituted the major group of melanised fungi. Two new species of the genus Ochroconis, O. lascauxensis and O. anomala, were isolated and described. The description is based on the morphology of the fungi and the phylogenetic relationships of two of its gene regions internal transcribed spacer (ITS) and RNA polymerase II subunit B (RPB2). In addition, data on their physiology and cellular fatty acid profiles are reported. The development of these species was likely linked to the presence of unusual carbon and nitrogen organic sources provided by the intensive biocide treatments. ► Two new species of the genus Ochroconis, O. lascauxensis and O. anomala are described. ► They were isolated from black stains on the walls of the Lascaux Cave, France. ► The descriptions are based on the morphology and ITS and RPB2 gene regions. ► In addition, data on their physiology and cellular fatty acids profiles are reported. ► The presence of these species was likely linked to an intensive biocide treatment. Fig 2. Progression of black stains on walls and paintings (the Black Cow) in the Nave between the years 2000 and 2007. The ellipse marks the affected area. Pictures from Ministère de la Culture et de la Communication, Centre National de la Préhistoire. 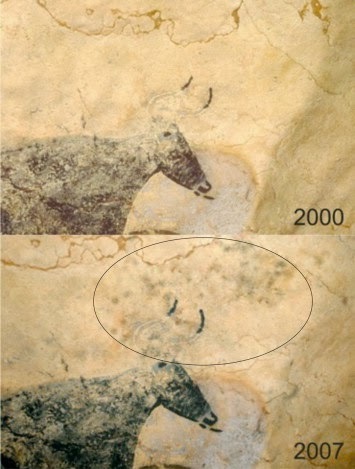 In 2001, black stains began to appear on the walls of Lascaux Cave in France. These stains were so prevalent by 2007 that they became one of the major concerns for the conservation of the precious rock art at the site that dates from the Upper Palaeolithic. A white fungus, Fusarium solani, outbreak had been successfully treated when, a few months later, black staining fungi appeared. 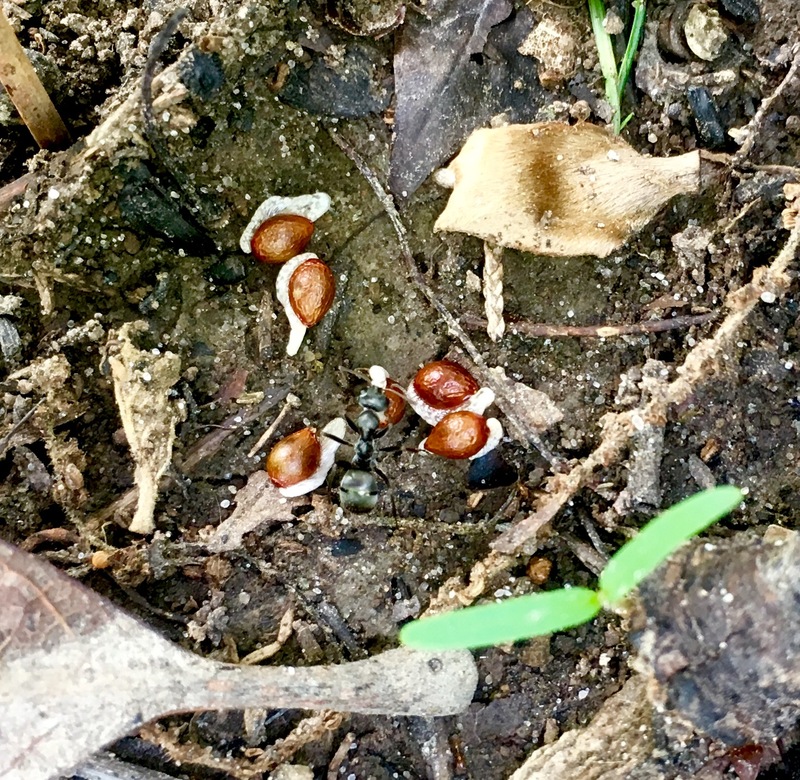 The genus Ochroconis primarily includes fungi occurring in the soil and associated with the decomposition of plant matter. While the two new species isolated from Lascaux, are as far as known harmless, at least one species of the group, O. gallopava, causes diseases in immunocompromised humans. Leander, Sandy. 2013. Scientists announce top 10 new species for 2013. 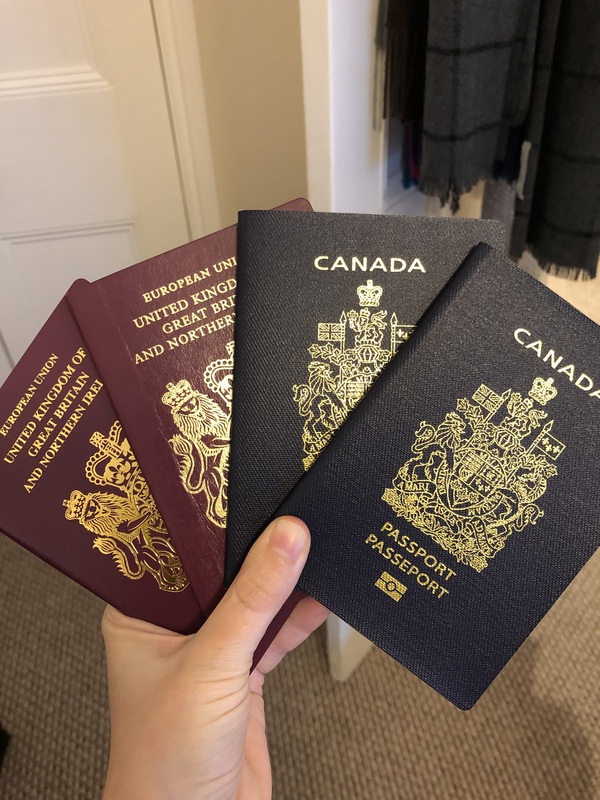 Many species travel in highly organized groups. The most quoted function of these configurations is to reduce energy expenditure and enhance locomotor performance of individuals in the assemblage. The distinctive V formation of bird flocks has long intrigued researchers and continues to attract both scientific and popular attention. The well-held belief is that such aggregations give an energetic benefit for those birds that are flying behind and to one side of another bird through using the regions of upwash generated by the wings of the preceding bird, although a definitive account of the aerodynamic implications of these formations has remained elusive. 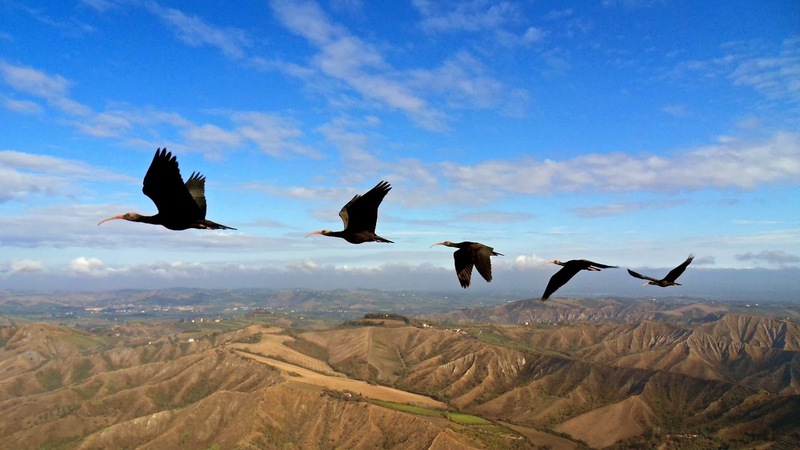 Here we show that individuals of northern bald ibises (Geronticus eremita) flying in a V flock position themselves in aerodynamically optimum positions, in that they agree with theoretical aerodynamic predictions. 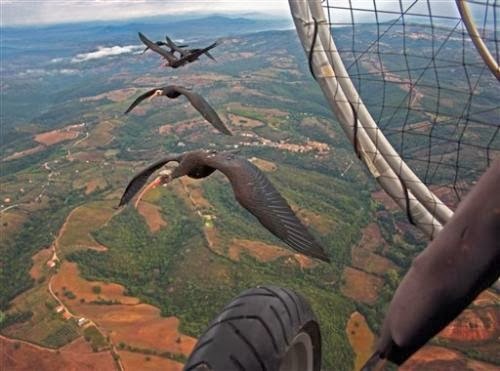 Furthermore, we demonstrate that birds show wingtip path coherence when flying in V positions, flapping spatially in phase and thus enabling upwash capture to be maximized throughout the entire flap cycle. In contrast, when birds fly immediately behind another bird—in a streamwise position—there is no wingtip path coherence; the wing-beats are in spatial anti-phase. 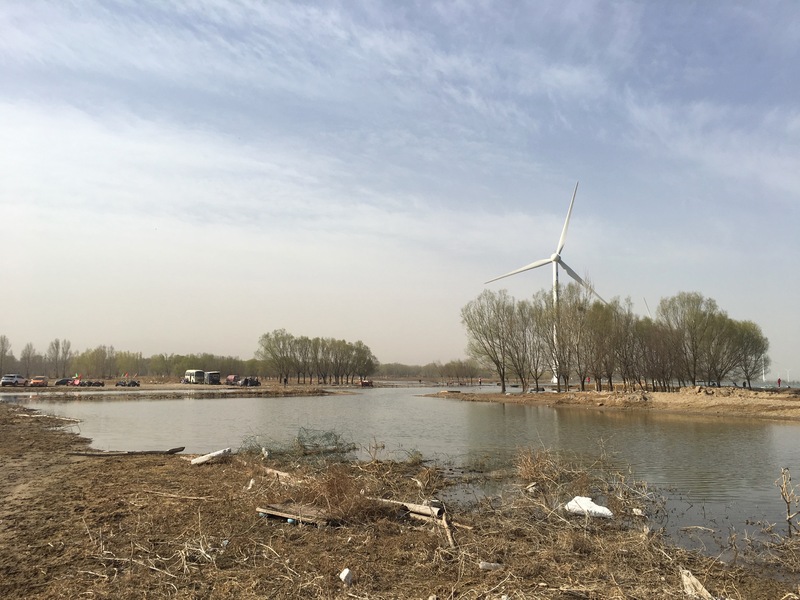 This could potentially reduce the adverse effects of downwash for the following bird. These aerodynamic accomplishments were previously not thought possible for birds because of the complex flight dynamics and sensory feedback that would be required to perform such a feat. We conclude that the intricate mechanisms involved in V formation flight indicate awareness of the spatial wake structures of nearby flock-mates, and remarkable ability either to sense or predict it. We suggest that birds in V formation have phasing strategies to cope with the dynamic wakes produced by flapping wings. A new study on 'Nature' says the birds choreograph the flapping of their wings, getting a boost from an updraft of air in the wake of the flapping wings by flying behind the first bird and off to the side. 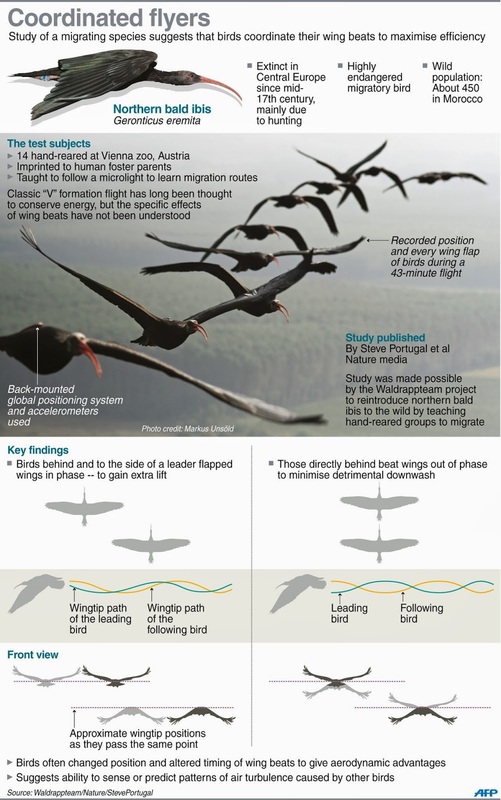 When a flock of birds take advantage of these aerodynamics, they form a V.
Steven J. Portugal, Tatjana Y. Hubel, Johannes Fritz, Stefanie Heese, Daniela Trobe, Bernhard Voelkl, Stephen Hailes, Alan M. Wilson & James R. Usherwood. 2014. Upwash Exploitation and Downwash Avoidance by Flap Phasing in Ibis Formation Flight. Nature. 505, 399–402. 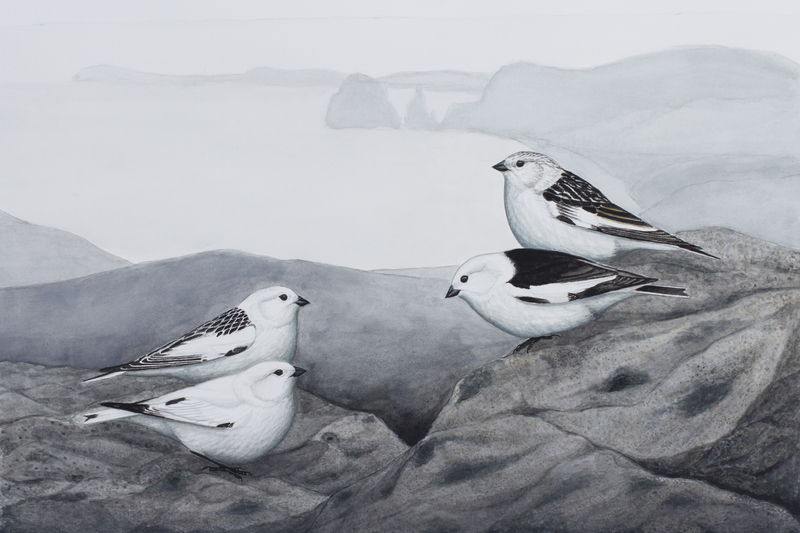 An endangered species helps scientists to learn why migrating birds fly in a familiar formation. 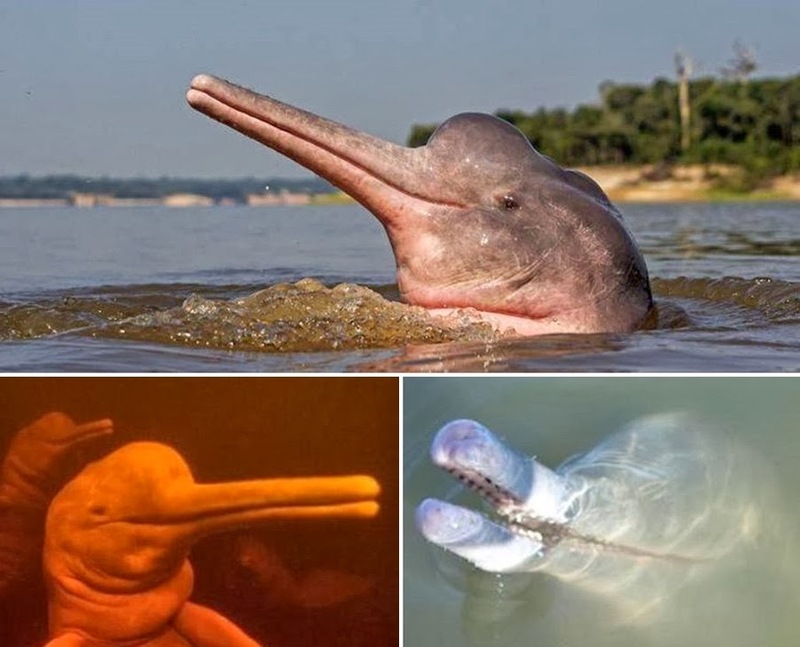 True river dolphins are some of the rarest and most endangered of all vertebrates. They comprise relict evolutionary lineages of high taxonomic distinctness and conservation value, but are afforded little protection. 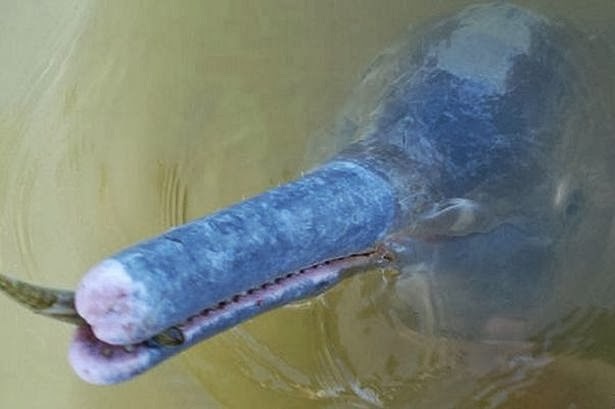 We report the discovery of a new species of a river dolphin from the Araguaia River basin of Brazil, the first such discovery in nearly 100 years. 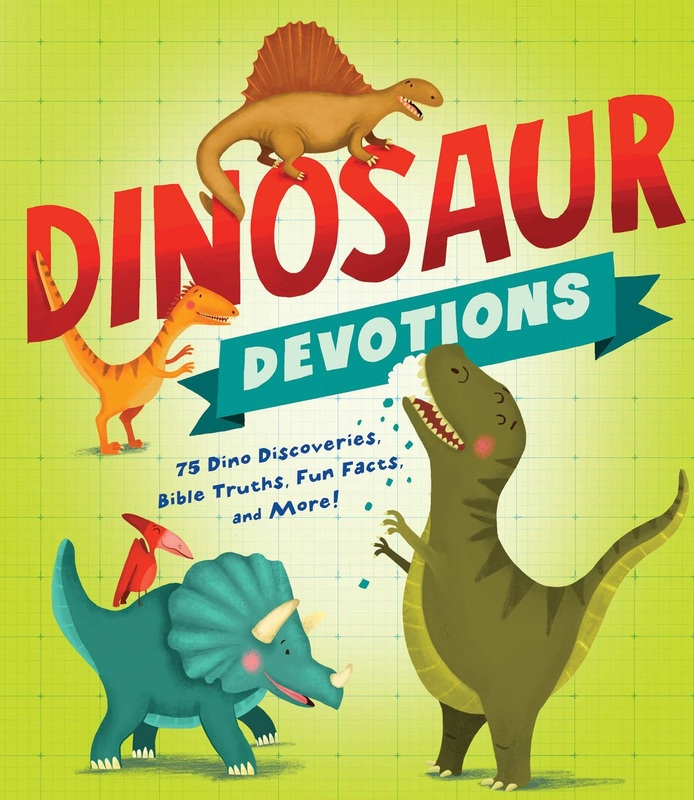 The species is diagnosable by a series of molecular and morphological characters and diverged from its Amazonian sister taxon 2.08 million years ago. The estimated time of divergence corresponds to the separation of the Araguaia-Tocantins basin from the Amazon basin. This discovery highlights the immensity of the deficit in our knowledge of Neotropical biodiversity, as well as vulnerability of biodiversity to anthropogenic actions in an increasingly threatened landscape. We anticipate that this study will provide an impetus for the taxonomic and conservation reanalysis of other taxa shared between the Araguaia and Amazon aquatic ecosystems, as well as stimulate historical biogeographical analyses of the two basins. 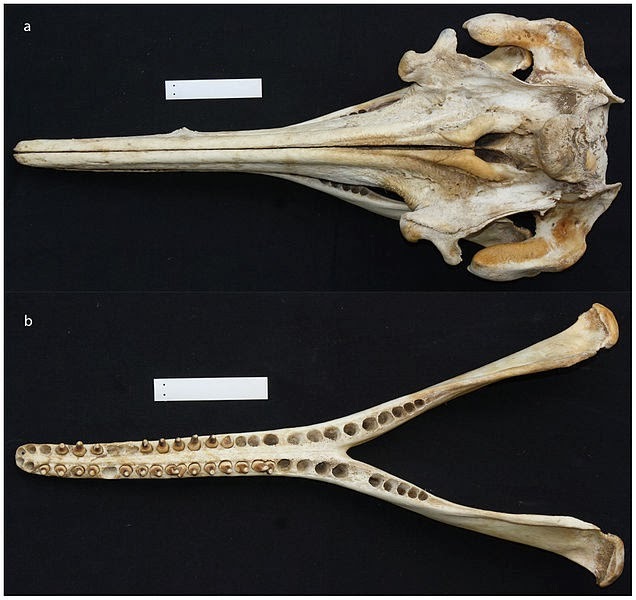 Cranium (a) and mandible (b) of the holotype of Inia araguaiaensis, a South American river dolphin species described in 2014. A 10 cm ruler is shown. Etymology: The specific name refers to the geographic area where the new species is currently known to occur. Suggested common name: We propose the common names “Boto-do-Araguaia” and “Araguaian boto” for this species. Boto is the common regional and international name of species of Inia, and Araguaia refers to the geographic distribution of this species. Figure 1. Distribution map of all known species and subspecies of Inia. show more Black outline denotes the limit of the Amazon basin. Question marks denote uncertainty as to which species occurs in the Tocantins River downstream of the Tucuruí dam which potentially delimits the distributions of I. geoffrensis and I. araguaiaensis sp. nov. Bars on the Madeira River represent a series of rapids that delimit the distribution of I. geoffrensis and I. boliviensis. 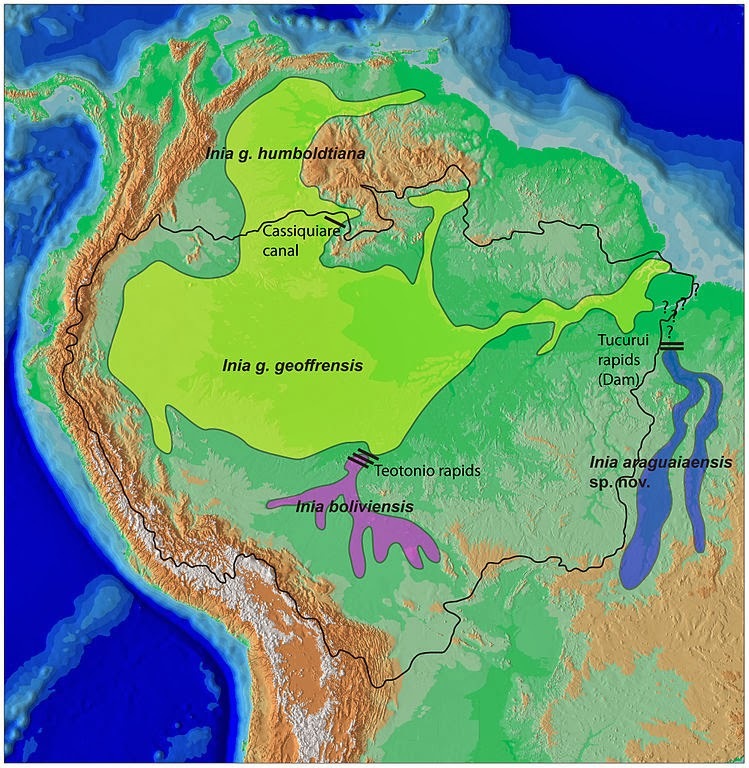 The single bar on the northern limit of the Amazon basin represents the Casiquiare canal which connects the Amazon and Orinoco basins, and is thought to delimit the I. g. humboldtiana subspecies from I. g. geoffrensis. Hrbek, Tomas; Da Silva, Vera Maria Ferreira; Dutra, Nicole; Gravena, Waleska; Martin, Anthony R.; Farias, Izeni Pires. 2014. 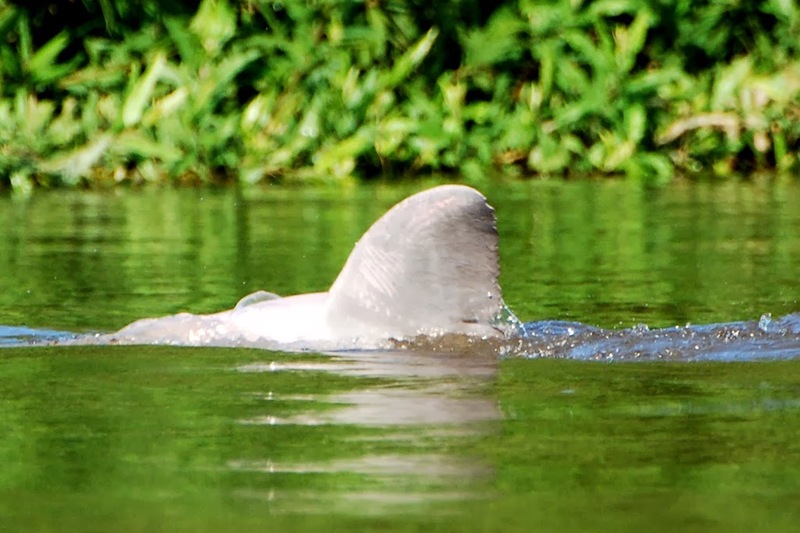 A New Species of River Dolphin from Brazil or: How Little Do We Know Our Biodiversity. In Turvey, Samuel T. PLoS ONE 9: e83623. A new species of Bent-toed Gecko Cyrtodactylus guakanthanensis sp. nov. of the C. sworderi complex is described from a limestone forest in Perak, Peninsular Malaysia whose karst formations at the type locality are within an active quarry. Cyrtodactylus guakanthanensis sp. nov. can be distinguished from all other Sundaland species by having the following suite of character states: adult SVL 77.7–82.2 mm; moderately sized, conical, weakly keeled, body tubercles; tubercles present on occiput, nape, and limbs, and extend posteriorly beyond base of tail; 37–44 ventral scales; no transversely enlarged, median, subcaudal scales; proximal subdigital lamellae transversely expanded; 19–21 subdigital lamellae on fourth toe; abrupt transition between posterior and ventral femoral scales; enlarged femoral scales; no femoral or precloacal pores; precloacal groove absent; wide, dark postorbital stripes from each eye extending posteriorly to the anterior margin of the shoulder region thence forming a transverse band across the anterior margin of the shoulder region; and body bearing five (rarely four) wide, bold, dark bands. Destruction of the karst microhabitat and surrounding limestone forest will extirpate this new species from the type locality and perhaps drive it to complete extinction given that it appears to be restricted to the particular microhabitat structure of the type locality and is not widely distributed throughout the karst formations. 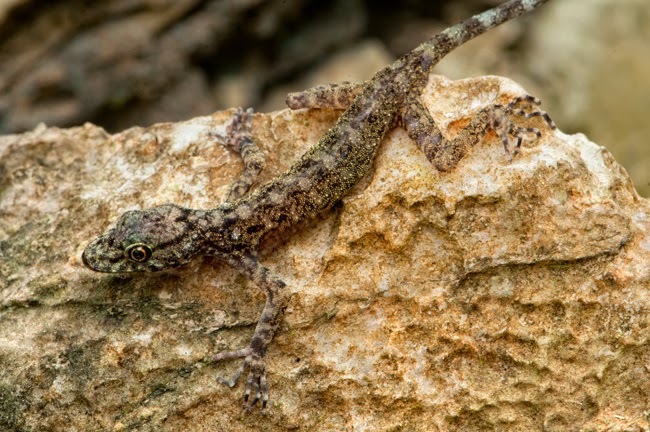 As with plants and invertebrates, limestone forests are proving to be significant areas of high herpetological endemism and should be afforded special conservation status rather than turned into cement. FIGURE 1. Distribution of the species of the Cyrotdactylus sworderi complex in Peninsular Malaysia. Cyrtodactylusquadrivirgatus was omitted owing to its ubiquitous distribution throughout Peninsular Malayisa (Grismer 2011a). Distribution: Currently, Cyrtodactylus guakanthanensis sp. nov. is known only from the type locality of Gua Kanthan in the Gunung Kanthan limestone forest, Perak, Peninsular Malaysia (Fig. 1). 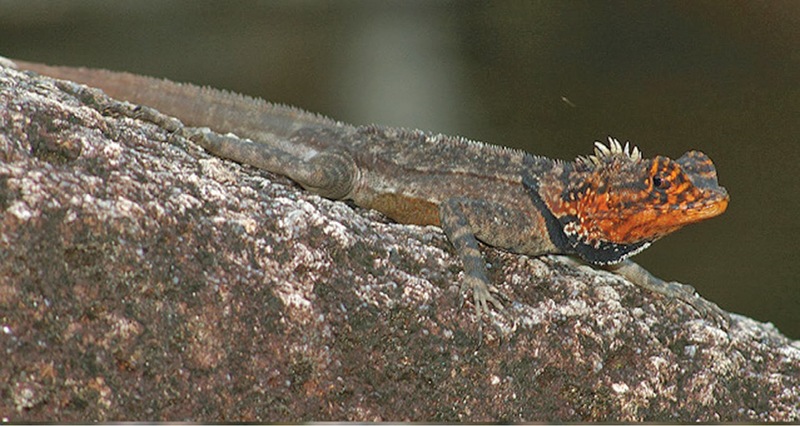 Natural history: All lizards specimens were active at night on the limestone walls, adjacent boulders surrounded by limestone forest, and the limestone forest vegetation. Lizards only occurred in areas where cliff faces were eroded and exfoliated, providing cracks and holes in which to take refuge during the day (Fig. 4). No lizards were found in areas where the cliff faces were smooth and bearing no surface irregularities. Many of the specimens observed were found in the adjacent vegetation between 0.5–4 m above the ground on the trunks of trees or on vertical and horizontal branches and vines, indicating that the surrounding forest itself is an integral part of this new species’ habitat preference. One specimen was observed deep within the cave where vegetation was absent. Hatchlings as small as 33.8 mm SVL (LSUDPC 8175; Fig. 3) were observed but no gravid females were found, suggesting that the reproductive season occurred in July. The Gunung Kanthan limestone forest surrounds 400 million year old limestone formations that harbor a number of unique plants and animals. Owing to the purity of its limestone, the area is scheduled to be quarried. Our data indicate that Cyrtodactylus guakanthanensis sp. nov. does not range continuously throughout the limestone forest but appears to be restricted to areas that have an eroded complex limestone microhabitat. One of the quarry zones targeted is Gua Kanthan, the type locality of C. guakanthanensis sp. nov. Grinding down the limestone in this area and cutting the surrounding forest will destroy the microhabitat to which this new species has adapted and our data indicate this species may not occur elsewhere. The discovery of Cyrtodactylus guakanthanensis sp. nov. adds to a growing body of evidence that karst regions should be protected and better studied. If reptiles are an indication of the hidden diversity within these unique habitats, then limestone forests may be some of the most biotically rich habitats in Peninsular Malaysia with a level of herpetological endemism approaching that of Malaysia’s islands (see Chan et al. 2010; Grismer 2008, 2011b; Grismer et al. 2011). Terminating this species before it is discovered, described, and studied is not only illogical, it is tantamount to discarding a wrapped gift before it is opened and its value assessed. Grismer, L. L., Daicus M. Belabut, Evan S. H. Quah, Chan K. Onn, JR. Perry L. Wood & Rosli Hasim. 2014. 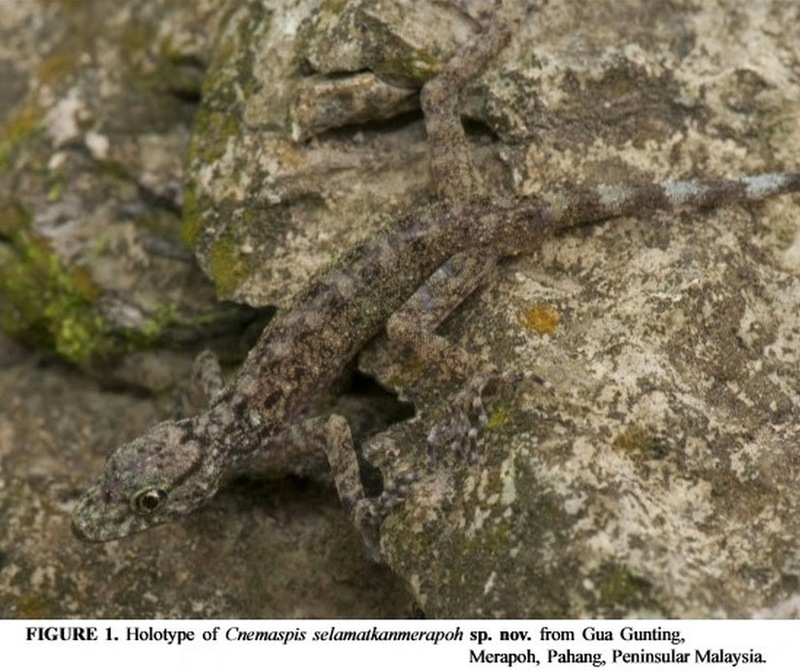 A New Species of Karst Forest-adapted Bent-toed Gecko (genus Cyrtodactylus Gray, 1827) belonging to the C. sworderi complex from a threatened Karst Forest in Perak, Peninsular Malaysia. Zootaxa. 3755(5): 434–446. 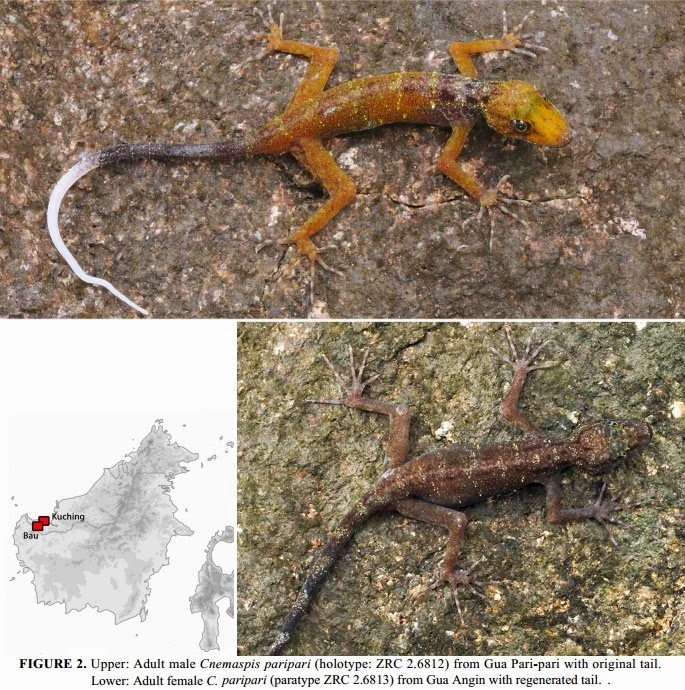 A new species of karst-adapted gekkonid lizard of the genus Cnemaspis Strauch is described from Gua Gunting and Gua Goyang in a karst region of Merapoh, Pahang, Peninsular Malaysia whose unique limestone formations are in immediate danger of being quarried. The new species differs from all other species of Cnemaspis based on its unique suite of morphological and color pattern characters. Its discovery underscores the unique biodiversity endemic to karst regions and adds to a growing list of karst-adapted reptiles from Peninsular Malaysia. 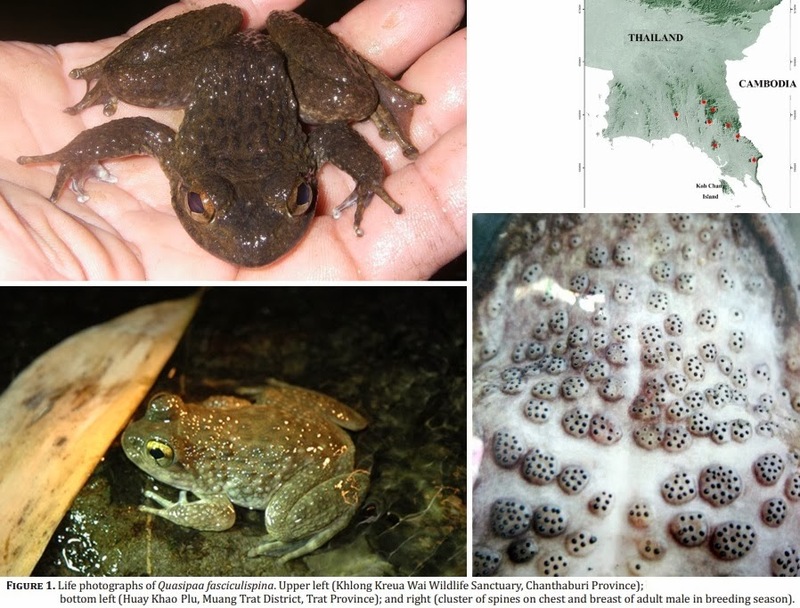 We posit that new karst-adapted species endemic to limestone forests will continue to be discovered and these regions will harbor a significant percentage of Peninsular Malaysia’s biodiversity and thusly should be conserved rather than quarried. Fresh off the shelf! Merapoh Rock Gecko Cnemaspis selamatkanmerapoh. The description of this endemic, karst specialist helped save the limestone caves in Kampung, Merapoh, Pahang from being quarried. Grismer, L. L., JR. Perry L. wood, Maketab Mohamed, Kin O. Chan, Heather M. Heinz, Alex S.-I. Sumarli, Jacob A. Chan & Ariel I. Loredo. 2013. A New Species of Karst-adapted Cnemaspis Strauch, 1887 (Squamata: Gekkonidae) from A Threatened Karst Region in Pahang, Peninsular Malaysia. Zootaxa. 3746(3): 463–472. Rammale Day Gecko Cnemaspis rammalensis sp. 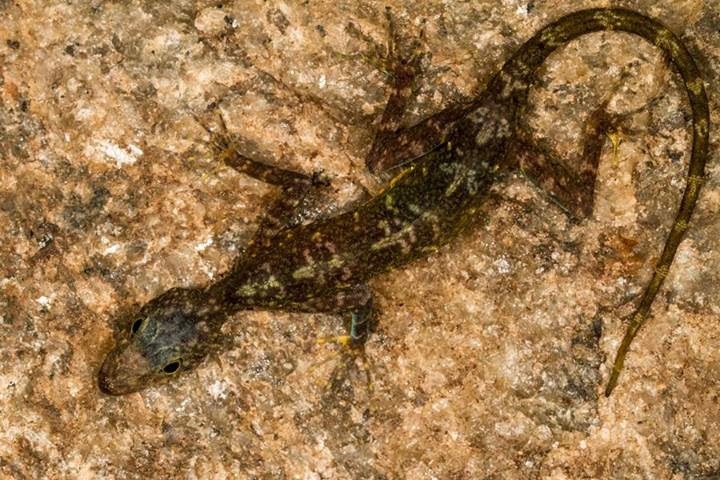 nov.
A new species of rock dwelling gecko belonging to the genus Cnemaspis is described from Sri Lanka based on a suite of morphological features. The species is the largest of its genus described from Sri Lanka so far (snout-vent length 52–54 mm) and is the second largest of the Western Ghats-Sri Lanka Biodiversity Hotspot. It may be diagnosed in details of both scalation (ventrals186–207; mid-subcaudals large; absence of precloacal pores; 15 femoral pores on each side; 22–23 and 23–25 subdigital lamellae on finger IV and on toe IV, respectively; smooth scales on tail dorsum) and colouration (five prominent trilobate shaped cream markings pointing towards head and extending from neck to vent).The species is found in a unique habitat in the Rammalakanda Forest, where it is threatened by deforestation. Etymology. The species epithet rammalensis is derived from “Rammalakanda” referring to the forest where the species was discovered. The specific name is an adjective derived from the geographical name. Suggested vernacular names. The vernacular names assigned for the species are Rammale diva huna, Rammale pahalpalli and Rammale Day Gecko in Sinhala, Tamil and in English, respectively. Vidanapathirana, D.R., M.D.G. Rajeev, S.S. Fernando, N. Wickramasinghe and L.J.M. Wickramasinghe. 2014. Cnemaspis rammalensis sp. nov., Sri Lanka’s largest day-gecko (Sauria: Gekkonidae: Cnemaspis) from Rammalakanda Man and Biosphere Reserve in southern Sri Lanka. Zootaxa. 3755(3): 273–286. 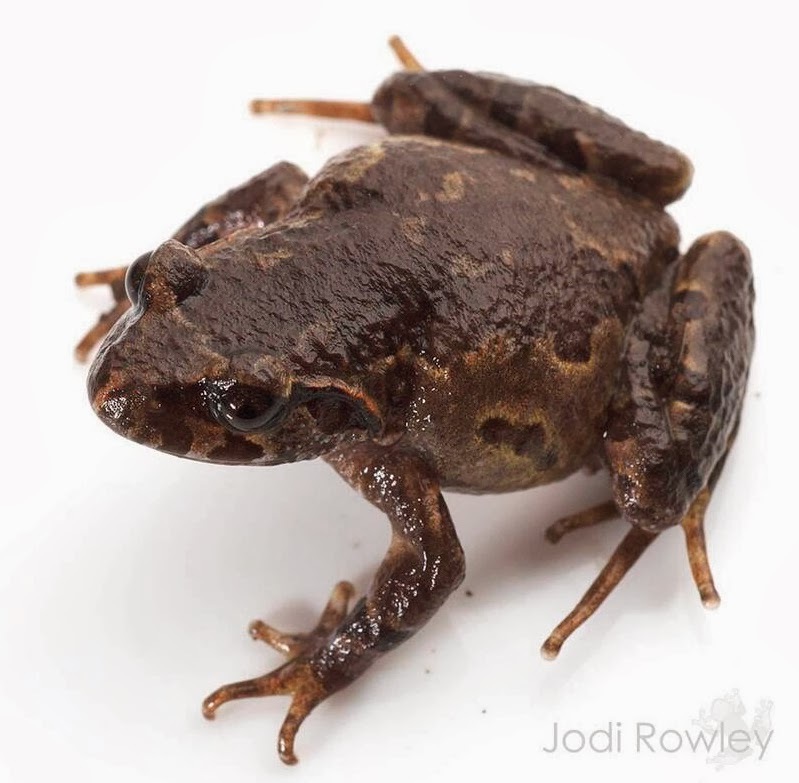 We record a tree frog of the genus Chiromantis for the first time from outside the Southeast Asian continent and describe it as a new species, Chiromantis inexpectatus. 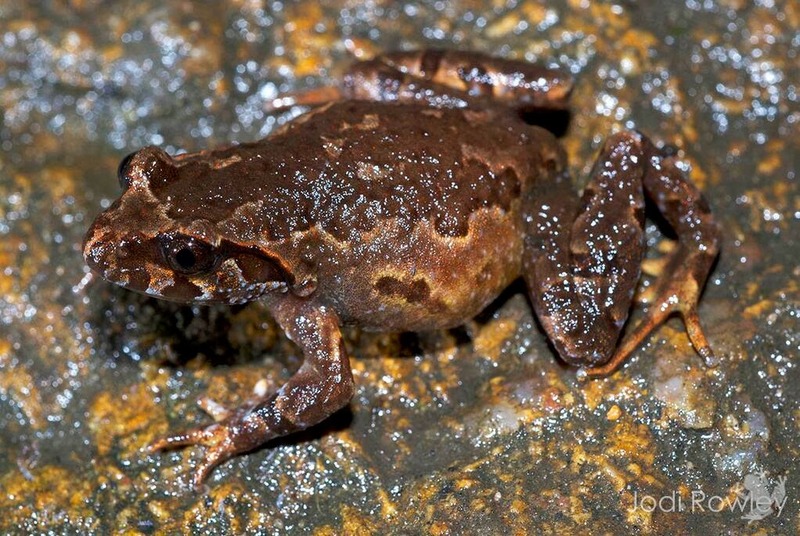 The new species from the Malaysian state of Sabah, Borneo, is a small-sized Chiromantis (male snout-vent length ca. 22 mm), and is distinguished from all other members of the genus by the combination of the following morphological characteristics: dark stripes absent, but dark spots present on dorsum; a dark-brown lateral band present from snout tip to half of body, bordered ventrally by white stripe; third and fourth fingers less than half webbed; third finger disk wider than tympanum diameter; and inner metatarsal tubercle present. Significance of findings of this species from Borneo Island, as well as phylogeny and breeding habit of the genus Chiromantis, are briefly discussed. Etymology: The specific name is a Latin adjective, referring to the fact that the occurrence of the genus on the island of Borneo, where the new species was found, was unexpected. Range: Known from the type locality, Camel Trophy of the Maliau Basin Conservation Area, Sandakan Division, State of Sabah, Malaysian Borneo. 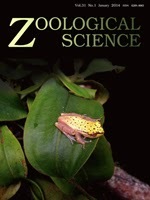 Natural history: In the type locality, Camel Trophy, two adult males and a metamorphosing juvenile of the type series were simultaneously found at night perching each on a leaf of low trees (< 1 m) extending above the surface of a shallow pool (3–5 m × 10 m). The air temperature before the time of finding was 24°C. No tadpoles were found in the pond nor eggs on overhanging leaves of trees. Early March may not be a breeding season since males were not calling, but is surely in the season of metamorphosis as evidenced by the presence of a juvenile with a degenerating tail. Frogs found together with the new species included Rhacophorus borneensis, Kurixalus appendiculatus, Polypedates macrotis (Boulenger, 1891), and Microhyla petrigena Inger and Frogner, 1979. 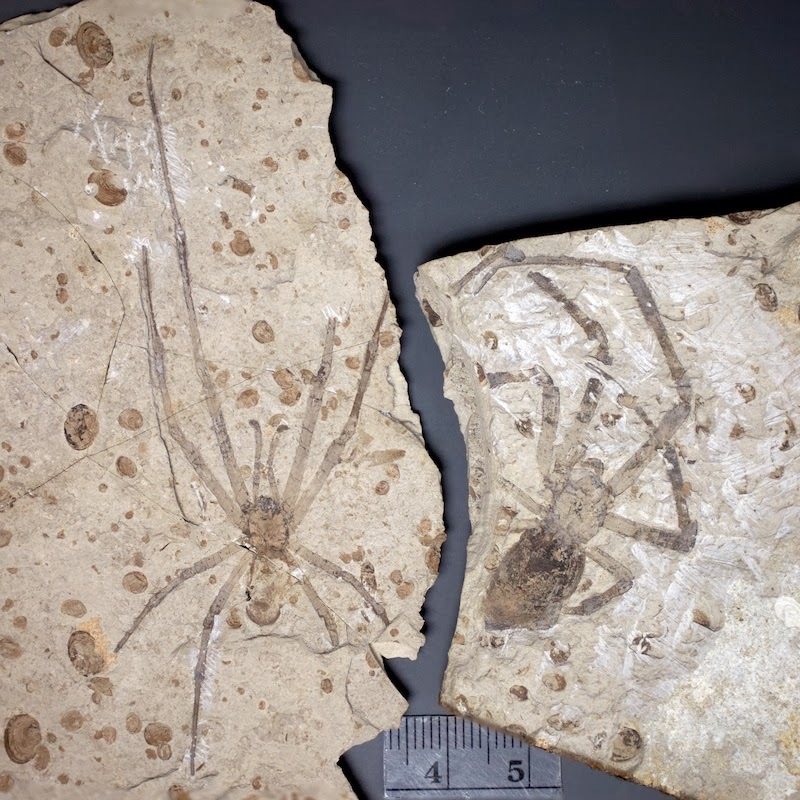 A large female spider, Nephila jurassica, was described from Middle Jurassic strata of north-east China and placed in the modern genus Nephila (family Nephilidae) on the basis of many morphological similarities, but, as with many ancient fossils, the single specimen lacked synapomorphies of the family (Selden et al. 2011). In order to test the placement within the nephilid phylogenetic tree, Kuntner et al. (2013) calibrated the molecular phylogeny using N. jurassica in three different scenarios based on inferred mitochondrial substitution rates. They concluded that N. jurassica fitted better as a stem orbicularian than a nephilid. Now, a giant male spider has been discovered at the same locality that yielded N. jurassica. The two sexes are considered conspecific based on their similar morphological features, size, and provenance. The male cannot be accommodated in Nephilidae because of its pedipalp morphology, so the new genus Mongolarachne and family Mongolarachnidae are erected for the species. Comparison with possibly related families show that Mongolarachnidae is most likely on the orbicularian stem, close to other cribellate orbicularians (e.g., Deinopoidea), which suggests a greater diversity of cribellate orbicularians during the Middle Jurassic. 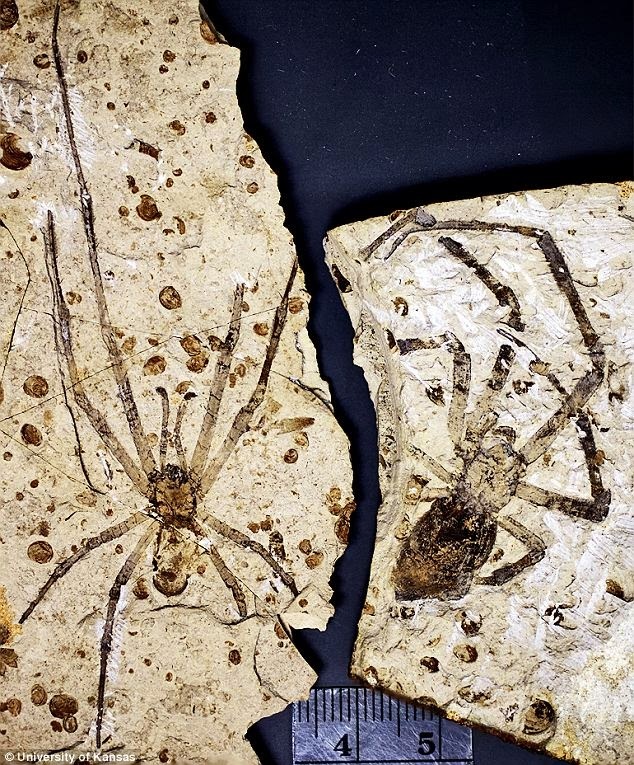 The largest known fossil spiders (left: male, right: female) belong to a newly described species of extinct arachnids, Mongolarachne jurassica. Etymology from the genus Mongolarachne gen. nov.
Etymology from the Inner Mongolia Autonomous Region, where the fossils were discovered, and the Greek άράχνη (L. arachne), a spider. Mongolarachne jurassica (Selden, Shih and Ren, 2011) comb. nov.
Selden, P. A.; Shih, C.K. ; Ren, D. 2013. 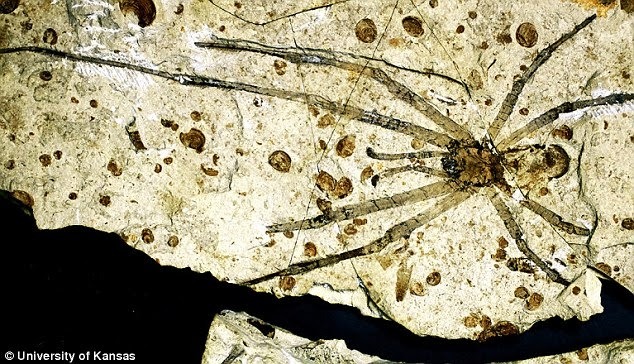 A Giant Spider from the Jurassic of China reveals Greater Diversity of the orbicularian Stem Group. Naturwissenschaften. 100 (12): 1171–1181. Selden, P. A.; Shih, C.K. ; Ren, D. 2011. A golden orb-weaver spider (Araneae: Nephilidae: Nephila) from the Middle Jurassic of China. Biology Letters. 7 (5): 775–8. doi: 10.1098/rsbl.2011.0228. 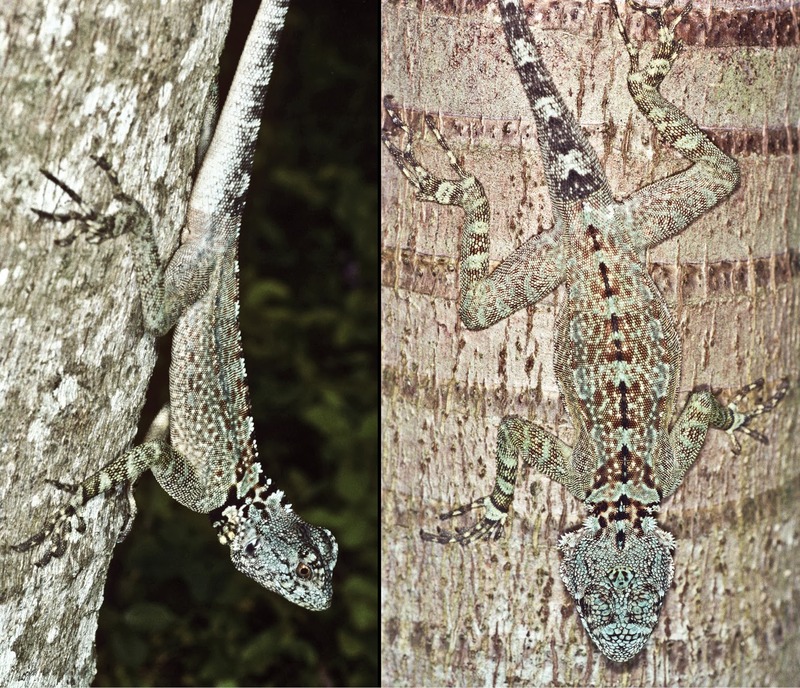 The arboreal, Neotropical lizard Plica plica (Linnaeus, 1758) has been long considered a widespread species with a distribution east of the Andes. A preliminary examination of 101 specimens from about 28 locations mostly north of the Amazon suggests that Plica plica is a cryptic species complex with taxa that can be distinguished on the basis of the number of scale rows at mid-body; the arrangement, shape and ornamentation of scales on the snout; the number of lamellae on the fourth toe; the number of subocular plates; as well as other commonly used external morphological traits. The allopatric species discussed here are concordant with northern South American geography. Plica plica (Linnaeus, 1758) is associated with the Guiana Shield (Suriname, Guyana and Venezuela). A second species, P. caribeana sp. n. is associated with the Caribbean Coastal Range of Venezuela including Trinidad and Tobago. A third, distinctive species, P. rayi sp. n. is associated with the middle Orinoco at the eastern edge of the Guiana Shield. Two other species, P. kathleenae sp. n. and P. medemi sp. n., each based upon a single specimen, one from the Sierra Acarai Mountains of Guyana, and the other from southern Meta, Colombia are described. In addition to morphological analyses, we sequenced 12S and 16S rDNA gene fragments from one Plica plica from Trinidad to assess its relationship and taxonomy to other mainland Plica cf. plica. The results suggest Plica caribeana sp. n. likely diverged prior to the separation of Trinidad from northern Venezuela. Isolation in the Caribbean Coastal Range during its rapid uplift in the late Miocene, combined with a marine incursion into northern Venezuela may have contributed to their genetic divergence from other populations. Hypsibatus agamoides – Court 1858: 440. Uraniscodon plica – Boulenger 1885, 2: 180 [in part]. Plica plica – Burt and Burt 1931: 282 [in part]. Tropidurus plica – Frost 1992: 1 [in part]. Etymology: Named for its Caribbean Coastal Range distribution. Distribution: Eastern Coastal Range (Cordillera de la Costa Oriental) of Venezuela south into Bolivar; Trinidad, the Bocas Islands (Huevos, Monos, and Gaspar Grande); Tobago (Murphy and Downie 2012). Etymology: Named in honor of Kathleen Kelly, Division of Amphibians and Reptiles, Field Museum of Natural History, for her interest and effort on behalf of herpetology. Distribution: Known only from the type locality in the Acarai Mountains of Guyana. Etymology: The lizard is named in honor of Colombian herpetologist Fredrico Medem. Distribution: Known only from the type locality at Angostura No. 2, Cerro de las Pinturas, Lower Guayabero, and Meta, Colombia. Plica plica – Etheridge 1970: 242 (in part). Etymology: This lizard is namedin honor of Ray Pawley, former Curator of Reptiles at Brookfield Zoo, for his lifelong interests and work on amphibians and reptiles. Suggested common name: Ray’s Treerunner. Distribution: Known from two localities along the Orinoco River:Puerto Ayacucho, Amazonas, Venezuela and Puerto Carreno, Vichada, Colombia. The distance between these two locations is about 65 km. They have also been observed at Tobogan de la Selva and Raudal de Danto at Autana. Figure 6. 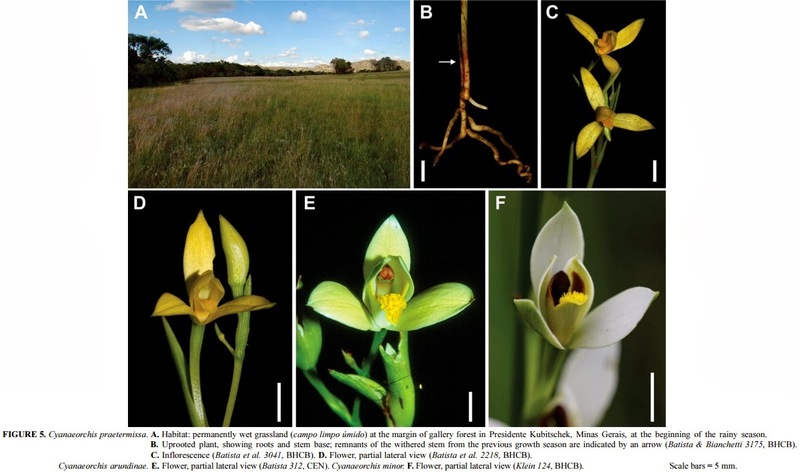 Distributions of Plica plica Group species discussed in this paper. Yellow – Plica plica; white Plica caribeana (because of scale not all Trinidad localities were plotted); red – Plica kathleenae; green – Plica medemi; light blue – Plica rayi; and the type localities of Plica pansticta and Plica lumaria are show in dark blue and orange respectively. A Google Earth map.